wlan equipment, wifi products including 2.4 ghz antennas,802.11B amp; 802.11G products,wireless network products and antennas for SMC,Linksys,D-Link,Cisco,Breezecom,IBM,Intel,lucent,Orinoco,Proxim,Wi-lan,Waveaccess and others at 2.4 ghz. If your problem is the wireless range of your laptop or desktop then read this and follow the steps below. Wireless networking at 2.4 GHz is a two way system. Each device must be capable of both sending and receiving a signal equal distances. Access points and wireless routers (as shipped from the manufacturer) have an advantage over laptop and desktop cards because they have a higher output power and therefore have the ability to send a signal further then most laptop and desktop cards. When a higher gain antenna is installed on a desktop card that devices output power is now increased closer to the output level of the access point or wireless router therefore equaling the two devices. 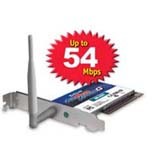 In some cases both the access point/wireless router and the desktop/laptop card antenna's may need to be replaced. This is if the distance you are attempting to achieve is greater than the distance the access point/wireless router is capable of when using the antenna's that came with your card. Building to Building Connections: When connecting two or more building's it is best to first establish a wireless bridge between the building's first. This is achieved by installing a wireless bridge. Then if you need to be wireless within a building then attempt to establish a wireless network within each building. Desktop/Laptop/ and other client devices will not work correctly if the access point/wireless router is not resident in the building where the access point/wireless router is located. You should consider step 4 for this application. Step 2: Laptop Fix: Most laptop cards have very poor receive sensitivity and therefore have very limited range. Replace your laptop card with a better card and consider additional antennas for these cards if your range is greater than 75-100 feet. Step 3: Access Point/ Wireless Router Fix : The above will increase the range of the laptop and desktop now if you wish to increase the range of the access point/wireless router than select an antenna bundle below that best fits your situation. Step 4: Connecting two or more buildings Fix : If you wish to connect two or more buildings together than select an wireless bridge bundle by clicking here. then is the correct bundle. 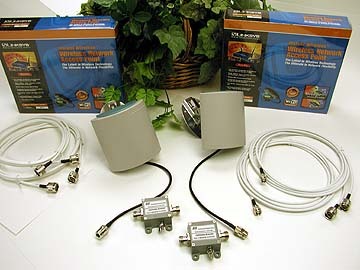 Two 6.0 dBi Directional antennas for your D-Link DI-614, DI-614P, DI-614P+ DI-714, DI714P+, Intel 2011B dual Antenna AP , Router, or print server. 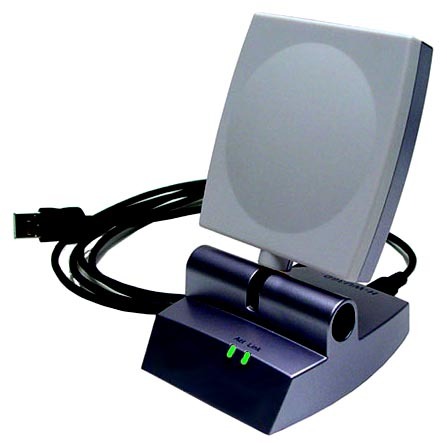 Two 5.0 dBi Omni Directional antennas for your D-Link DI-614, DI-614P, DI-614P+ DI-714, DI714P+, Intel 2011B dual Antenna AP , Router, or print server. 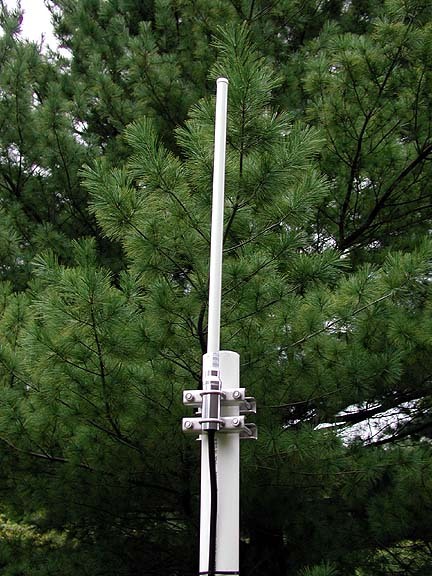 Dont forget to purchase a client set up for each outside client over 50 feet from this antenna. Call tech support at (888) 588-3800 Ext 21 if you are not sure of which client setup is best for your applications. 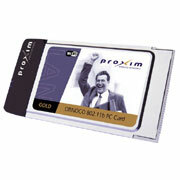 An Orinoco Gold Card, for your laptop and one 6.0 dBi 70 degree directional antenna and adapter. to increase the range of the card. 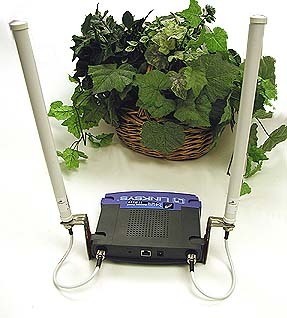 A 12.0 dBi antenna and a 10 foot cable that mates to a RPSMA female connector such as on the Linksys WMP11, WMP54G, WET11, Connectgear WA300 Access Point, D-link DWL-520, DWL-520+ DWL-900AP, DWL-900AP+,Hawking Technology access points and client devices , and all Zoom products. 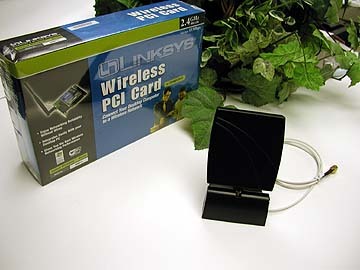 A Linksys WMP11 Desktop Wireless PCI Card plus a 6.0 dBi antenna and a 3 foot low loss cable. A Linksys WMP11 Desktop Wireless PCI Card plus a 6.0 dBi antenna and a 7 foot low loss cable. 14 dBi Antenna, with a 20ft Low Loss outdoor Cable, and 5 ft indoor cable with a RPSMA male connector that mates to a RPSMA female connector such as on the Linksys WMP11, WMP54G, WET11, Connectgear WA300 Access Point, D-link DWL-520, DWL-520+ DWL-900AP, DWL-900AP+, and all Zoom products. 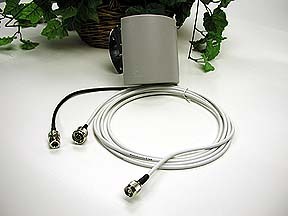 14 dBi Antenna, with a 40ft Low Loss outdoor Cable, and 10 ft indoor cable with a RPSMA male connector that mates to a RPSMA female connector such as on the Linksys WMP11, WMP54G, WET11, Connectgear WA300 Access Point, D-link DWL-520, DWL-520+ DWL-900AP, DWL-900AP+, Hawking Technology access points and client devices ,and all Zoom products. 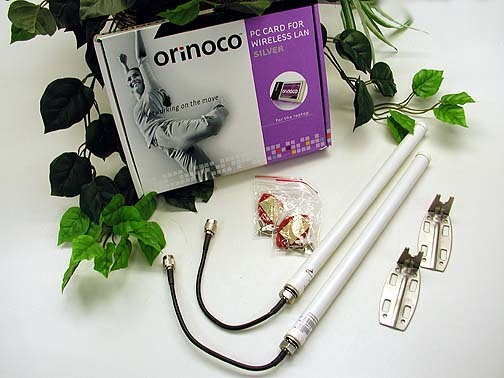 Lucent/Orinoco Gold Card, A 12.0 dBi antenna and a 10 foot cable, and an adapter that mates to the Orinoco Card. 8 dBi Antenna, with a 10ft Low Loss Cable, RPSMA male connector that mates to a RPSMA female connector such as on the Linksys WMP11, WMP54G, WET11, Connectgear WA300 Access Point, D-link DWL-520, DWL-520+ DWL-900AP, DWL-900AP+, Hawking Technology access points and client devices ,and all Zoom products. 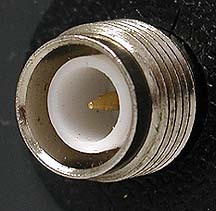 8 dBi Antenna, with a 10ft Low Loss Cable, RPBNC male connector that mates to a RPBNC female connector such as on the Intel/Pro, and symbol wireless products with RPBNC connectors. Looking To share internet access between two buildings or homes without putting antennas outside the building? Two Linksys WAP11 radios, two 10 ft cables, two indoor window mount 12.0 dBi gain antennas. Complete indoor Wireless Bridge connect Two Buildings Up to 1500 feet apart with this wireless bridge. Note: Each antenna must look at the other antenna when mounted in the window. Remember you can always use a longer CAT5 cable to Re-locate the WAP11 within 10feet of the window. Connect Two Buildings Up to 1000 feet apart with this wireless bridge. Tech Support is limited to the cables and antennas on this bundle. We will not offer support on setting up the radios unless the radios were purchased from us separately or in a bundle. Connect Two Buildings Up to 3 miles apart with this wireless bridge. A 4.0 dBi Omni directional antenna that mounts to the ceiling. This bundle includes a 6 ft cable that mates to a RPSMA female connector such as on the Linksys WET11, Connectgear WA300 Access Point, D-link DWL-520, DWL-520+ DWL-900AP, DWL-900AP+, Hawking Technology access points and client devices , and Zoom products. Included in this bundle is a 12.0 dBi antenna, a 10 foot cable , WET11 Plug and Play wireless device. The WET11 when plugged into a network port will make that network device a wireless device. Plug it into a Hub, Router, PC, Laptop, or any device with a RJ45 LAN Port. 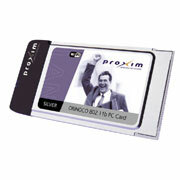 Proxim's ORiNOCO 11b/g Silver PC Card offers an incredible value to enterprise, education and government institutions. This combination 802.11b and g client adapter delivers the highest 54Mbps performance and a full suite of enterprise-class features including 802.11d global roaming. A comprehensive and easy to use client utility provides configuration, status and site monitor functions. Furnished with IEEE 802.1X authentication key management protocol (key distribution), the card is also software upgradeable to Wi-Fi Protected Access (WPA). and a full suite of enterprise-class features including 802.11d global roaming,transmitter power control and unlimited location profiles for storing configuration and security setting for multiple networks. A comprehensive and easy to use client utility provides configuration, status and site monitor functions. Furnished with IEEE 802.1X authentication key management protocol (key distribution), the card is also software upgradeable to Wi-Fi Protected Access (WPA). 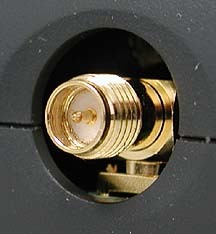 External Antenna Connector allows for installation of Range extender antennas and for use in AP devices. The Proxim 11b USB Adapter is used to connect your computer to any compliant 802.11bWi-Fi network. 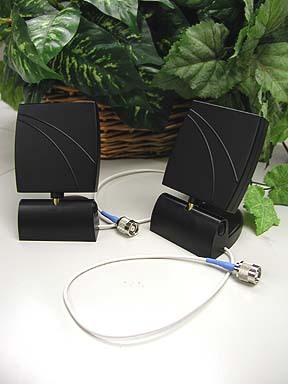 The adapter provides 11Mbps operation in the 2.4GHz license-free frequency band. 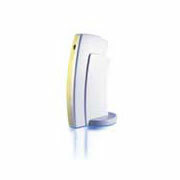 It is compliant with the USB 1.1 standard to ensure safe and reliable operation with the USB port on your computer. With superior radio performance Proxim has been proven to give the best 802.11b range and throughput in the industry. Comes in Gold version, the card is equipped with a choice of security levels to protect your data, Gold with user selectable 64- and 128-bit WEP keys. The version is upgradeable to Wi-Fi Protected Access (WPA). The 11b USB Adapter is part of ORiNOCO product family offering a broad choice of high performance 802.11 solutions. The Proxim 11b USB Adapter connects your notebook and desktop computers to any Wi-Fi 802.11b wireless network. With its small profile and modern design, the USB Adapter fits easily and looks good in any office or home location. Equipped with a 5 foot USB cable, the adapter can be placed in an optimal location for linking to your gateway or access point. Superior ORiNOCO performance enables you to work the way you want, anytime and anywhere in the world. "No Other Wireless USB Device On The Market Comes Close"
"Completly Fixed My Wireless USB Range Problem"
"I am In Love Thanks HD"
"Just when I was going to give up on 802.11...... wow thanks HD Comm"
than standard wireless adapters, this USB Device simply outperforms the competition. The USB interface lets you take your Wireless Hi-Gain Network Adapter with you wherever you go. Connect to your desktop or your laptop and never worry about losing your Installation is very simple. Insert the included CD into your CD-ROM drive and follow the Step by Step instructions that automatically load onto your computer screen.The Wireless software utility included in the package is easy to use, yet rich in advanced features for more savvy users. INTERFACE/BUS- USB 1.x portDATA RATE - Range (meter/ft.) 11 Mbps Outdoor: 150M/500 ft. Indoor: 50M/165 ft. 5.5 Mbps Outdoor: 300M/1000 ft. Indoor: 80M/ 270 ft.
"This WiFi Card Kicks A.."
- Provides high-performance connectivity and the freedom to move around. - Includes 4 3/4" (12mm) MMCX to reverse polarity SMA converter cable. "The Linksys Wireless-B Media Adapter lets you bring the digital pictures and music stored on your computer to your Home Entertainment Center, without running cables through the house. Using a wireless connection, the Media Adapter displays your digital photographs on the TV for the whole family to enjoy. And your digital music collection is finally freed from those little computer speakers and can play in full glory through your stereo system." The Wireless-B Media Adapter sits by your home stereo and television and connects to them using standard consumer electronics cables. Then it connects to your home network by Wireless-B (802.11b) wireless networking, or if you prefer, it can be connected via standard 10/100 Ethernet cabling. Using the included remote control and the user-friendly menus on your TV, you can browse through the digital pictures on your computer by folder, filename, or thumbnail. You can view pictures one at a time, or watch an automatically created slideshow of all the pictures in a given folder. The Media Adapter supports five popular picture formats: JPG, GIF, TIF and BMP. Use the remote control's Zoom button to get a close-up of the details in your pictures. "You can also use the remote to browse your MP3 or WMA formatted music collection by title, artist, genre, folder, or playlist. Choose the music you want, and let the Wireless-B Media Adapter play it through your stereo system. You can even let music play in the background while you browse your pictures. Let the Linksys Wireless-B Media Adapter bring your digital media out into the living room for the whole family to enjoy." 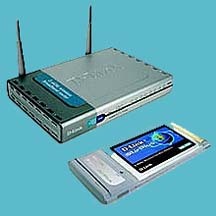 The Wireless-B Game Adapter gives any wired-Ethernet-equipped game console wireless connection capabilities. The Game Adapter can be used in two different ways. If you have an existing home wireless network with a cable or DSL Internet connection, the Game Adapter lets your PlayStation®2, Xbox or GameCube attach to the network so you can get into online games without running wires to the game room. Or, use a pair of Game Adapters to form a "cable-less cable" between two game consoles for head-to-head gaming -- in the same room, or all the way across the house. It's completely driver-free, so there's no software-installation hassle, and it works on any platform. And the innovative Channel Selector Button with LED display makes wireless network configuration into child's play. If you're using two Game Adapters, just press their Channel Selector Buttons until the channel numbers match, and you're connected. To connect to an existing wireless network, press the Button to select Infrastructure mode. If your setup's a little different, there's an easy-to-use PC-based Setup Wizard to guide you through. Then just plug the Adapter into your game box, and go. The Wireless-B Gaming Adapter provides lag-free gaming with communication speeds up to 11Mbps. So spend your time gaming, not stringing wires, with the Linksys Wireless-B Gaming Adapter. The DWL-2000AP can be configured to perform in any one of four modes - as a wireless access point, as a point-to-point bridge with another access point, as a point-to-multi-point wireless bridge, or as a wireless client. This unique feature makes the DWL-2000AP an ideal solution for quickly creating and extending a wireless local area network (WLAN) in offices or other workplaces, or even at trade shows and other special events. Note: D-Link only supports the DWL-2000AP connecting in client mode to another DWL-2000AP. 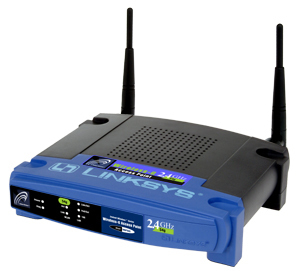 The DWL-2000AP cannot be a client to other wireless routers or access points. The AirPlus DI-614+ combines the latest advancements in 802.11b silicon chip technology from Texas Instruments and robust firewall security features. The DI-614+ is ideal for those creating their first wireless network, as well as for more advanced users looking for additional management settings and policy-based content filtering. Filters can be set based on MAC address, IP address, URL and/or Domain Name. 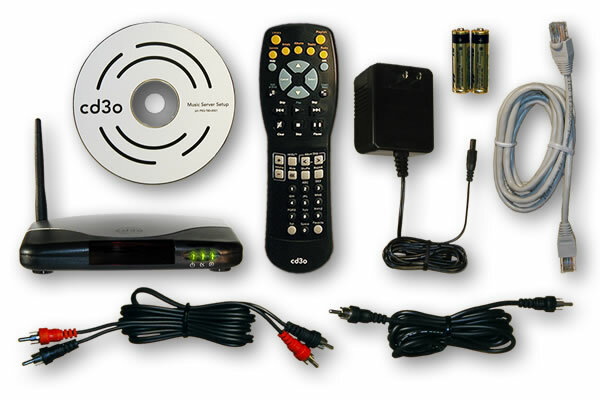 A simple yet intelligent, web-based setup wizard makes the DI-614+ easy for any user to quickly and securely connect computers to share a high-speed Internet connection, files, resources, games or just to communicate. An integrated 4-port switch allows direct connection of up to four computers. 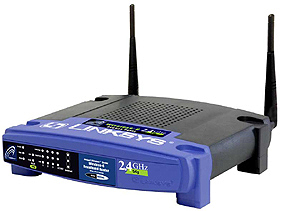 Several wireless clients can also securely connect to the network using 64, 128, or 256-bit encryption. Additional advanced features include pass-through of multiple concurrent IPSec and PPTP VPN sessions for telecommuters or for anyone who needs to transmit sensitive information more securely. The D-Link AirPlus DI-614+ is the ideal networking solution for small offices, home offices, schools, coffee shops and other small businesses that cater to the public, or home offices, and dormrooms. The D-Link AirPlus DWL-520+ PCI Adapter is an enhanced 802.11b adapter featuring advanced silicon chip technology from Texas Instruments. The DWL-520+ is fully compatible with the IEEE 802.11b standard making it interoperable with all existing 802.11b compliant devices. Now you can transfer files or communicate up to 20% faster than previous 802.11b solutions, even when connected to a standard 802.11b network. When you're connected to other D-Link AirPlus products, the performance is even greater - up to 22Mbps! The DWL-650+ is an enhanced 802.11b cardbus featuring advanced silicon chip technology from Texas Instruments. The DWL-650+ is fully compatible with the IEEE 802.11b standard making it inter-operable with all existing 802.11b compliant devices. Now you can transfer files or communicate up to 20% faster than previous 802.11b solutions, even when connected to a standard 802.11b network. When you're connected to other D-Link AirPlus products, the performance is even greater-up to 22Mbps! The DWL-650+ also features 256-bit WEP encryption providing you a higher level of security for your data and communications. 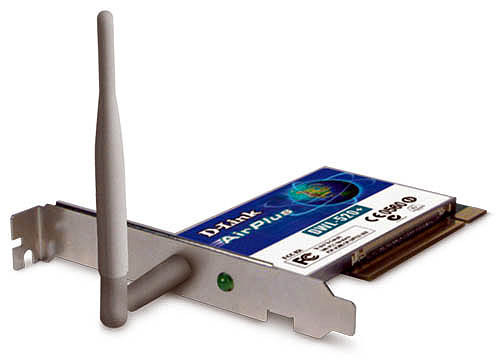 The D-Link AirPlus Xtreme G DWL-G520 PCI Adapter is a wireless PCI adapter featuring the very latest in advanced wireless silicon chip technology to deliver incredibly fast data transfer in the 2.4GHz frequency. The DWL-G520 also works with 802.11b standard wireless devices and when used with other D-Link AirPlus Xtreme G products delivers throughput speeds capable of handling heavy data payloads including real-time MPEG video streaming. The DWL-G520 is a powerful 32-bit PCI adapter that installs quickly and easily into desktop PCs and when used with other D-Link AirPlus Xtreme G products automatically connects to the network. 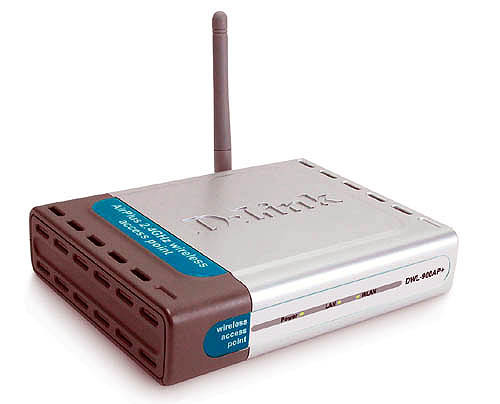 Like all D-Link wireless adapters, the DWL-G520 can be used in ad-hoc mode to connect directly with other 2.4GHz wireless computers for peer-to-peer file sharing or in infrastructure mode to connect with a wireless access point or router for access to the Internet in your office or home network. Supported Operating Systems: Windows 98 Second Edition, 2000, Me, and XP. 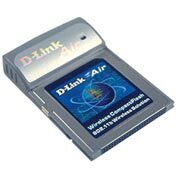 The D-Link AirPlus DWL-G650 Cardbus Adapter is a wireless cardbus featuring the very latest in advanced wireless silicon chip technology including enhanced security to shield and protect your wireless communication from intruders. The DWL-G650 also works with 802.11b standard wireless devices and when used with other D-Link AirPlus Xtreme G products delivers throughput speeds capable of handling heavy data payloads including real-time MPEG video streaming. The DWL-122 connects to any available USB port on a notebook or desktop Windows and Macintosh-based computer and also includes a standard USB extension cable. With its USB extension cable (included) the DWL-122 can be positioned virtually anywhere at a workstation to achieve the best available wireless signal reception - whether that workstation is in your office, on your deck or patio, by the pool, at the local coffee shop, or in an airport terminal while waiting to board your next flight. The adapter works with Apple Mac OS X (10.2x) Jaguar, Microsoft Windows XP, Windows 2000 and other Windows operating systems to ensure that you'll be up and running on a wireless network in just a matter of seconds. The DWL-122 also features 64 or 128-bit WEP encryption providing a level of security for the data that you wirelessly transmit. 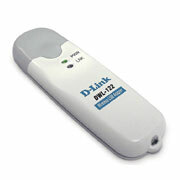 Using its default settings, the DWL-122 automatically connects to other D-Link wireless products as soon as it's active. 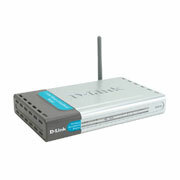 The D-Link DCF-660W is a wireless Compact Flash card that is IEEE 802.11b compliant. The DCF-660W provides a solution to connect PDAs (Personal Digital Assistants) to an existing IEEE 802.11b wireless network. The DCF-660W operates in the 2.4GHz frequency range and utilizes Direct Sequence Spread Spectrum (DSSS). 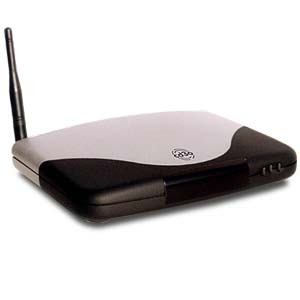 The DCF-660W is for users of PDAs who want the convenience of roaming and connecting to an existing wireless network without being tethered to wires. The DCF-660W will operate in either Ad-Hoc mode (networking without an Access Point) or in Infrastructure mode (networking using an Access Point). The DCF-660W will transmit data at 11, 5.5, 2, or 1Mbps. Also, the DCF-660W provides an "Auto Fall-Back" feature to automatically adjust the speed of the adapter depending on the distance from the Access Point. In an open environment, the DCF-660W with its built-in antenna has a range of up to 460 feet at 11Mbps and up to 1,311 feet at 1Mbps. The DCF-660W requires a Compact Flash type I or II interface (available in most PDAs). To ensure long battery life, the DCF-660W has minimal power consumption of 80mA in Power Save mode and less than 350mA in transmission mode. The DCF-660W is compatible with Windows CE version 3.0 and works with Windows PC 2002. Give your handheld PDA a whole new level of versatility with the 802.11b 11Mbps. 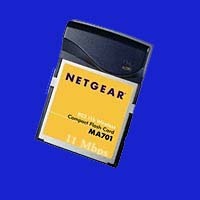 2.4GHz Wireless Compact Flash Card from NETGEAR. It's ideal for mobile professionals using PocketPCs or other Windows CD-based mobile computers. Fits into either a Type I or Type II card slot on your handheld. Send and receive email, wirelessly synchronize with your notebook PC, and browse the Internet, all from your PDA. With the cd3o c300 extended-range wireless network MP3 player you can now digitally stream your MP3 and WMA music collection from your PC to your existing audio equipment. Wireless or wired, the Voice-Guide remote control allows you to easily navigate your music collection from across the room. Up to 10 quick-access favorites ­ playlists, genres, albums ­ anything! HD Communications Corp. Only Charges What The Actual Cost To Ship The Item/Items To Your Location. * Distances are based on direct line of site in most real world situations. Greater distances are possible but Obstructions, Weather, interference, etc. can have an effect on performance. ® Trademarks are property of their respectful owners HD Communications Corp. claims/implies no relationship. Still don't see what you are looking for ? Copyright (c) 1998 - 2004 HD Communications Corp.
Netscape Navigator, Microsoft Internet Explorer, and AOL browsers.